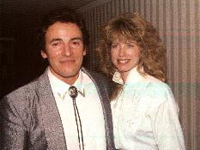 Bruce Springsteen and Julianne Phillips were married in her hometown of Lake Oswega, Oregon on May 13, 1985. Phillips grew up in this Portland suburb as the daughter of an insurance broker, William Phillips and his wife Ann Phillips. She was the youngest of six children. Phillips was born May 6, 1960 and graduated from Lake Oswego High School and Brooks College. She began work as a model in Manhattan in the early 1980s. By 1982 she was represented by the Elite Modeling Agency, which characterized her as a “perfect ten package” earning as much as $2,000 a day. She then moved to Los Angeles, where she appeared in a .38 Special music video. This led to her first notable acting roles, in 1984′s made-for-TV movies Summer Fantasy and the Robert Urich vehicle His Mistress. She also appears at the end of the Bruce Springsteen music video Glory Days. Springsteen and Phillips met in October 1984 when Phillips was 25 years old. They were introduced by his booking agent, Barry Bell. Opposites in background, their marriage was not long-lived. Springsteen’s 1987 album Tunnel of Love described some of his unhappinesses in the relationship. During the subsequent Tunnel of Love Express tour, Springsteen took up with backup singer and fellow New Jersey resident Patti Scialfa. The couple’s breakup is perceived to have inspired several Springsteen songs, including most notably “Light of Day”, which Springsteen wrote for rock icon Joan Jett. Media reports made it appear that Phillips found out about Springsteen’s relationship with Scialfa by reading of its extensive coverage in tabloids. As recounted in Dave Marsh’s book, Glory Days – 3rd Edition, however, the couple had agreed to a separation during Springsteen’s Tunnel of Love tour. Phillips and Springsteen filed for divorce on August 30, 1988. The divorce was finalized on March 1, 1989 and Springsteen married Scialfa two years later, in 1991. Bruce may be the only artist who has had current and future wives appear in the same video, then-wife Julianne Phillips and wife-to-be Patti Scialfa are both in the “Glory Days” and “Born to Run” videos.